One day, a hungry fox was walking around the dense forest, searching for some food. He came near a river and sat on the bank of that river. There the fox saw to otters playing in the water. Suddenly one of the otters, saw a big fish in the water. Quickly he caught the tail of the fish. The fish was very big and tried to escape from the hold of the otter. The other otter saw this, and he immediately caught the head of the fish. 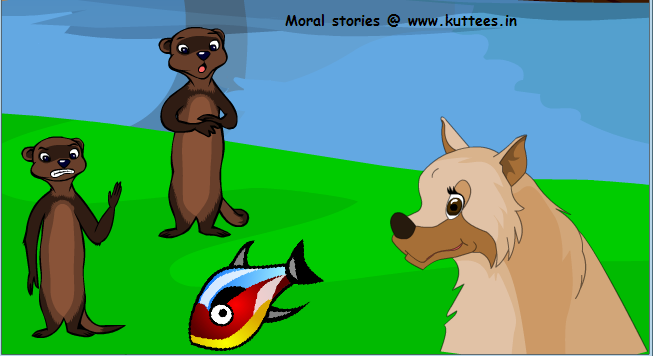 The two otters dragged the fish to the shore and the fish had no chance to escape then. But when the two otters wanted share the fish, they started fighting with each other. Both of them wanted a bigger share of the fish. The fox was watching all this. Suddenly, a good plan flashed in the fox's mind. He went to the otters and said that he could share the fish equally between them both. The two otters didn't know about the evil plan of the fox, so they gave the big fish to the fox. The fox tore the head of the fish and turned to otter that caught the head of the fish, and said "Dear friend, I saw you catching the head of the fish. So here is the head for you"
Then he tore the tail of the fish and said to the second otter , "Dear friend you caught the tail of the fish. So here is the tail for you"
Both the otters were confused with what they saw. The fox was now having the body of the fish, which had the flesh they could eat. Now the cunning fox said, "Friends, since I have solved the problem between you both. As my share, I take this part of the fish"
Saying this, the fox held the fish in its mouth and ran away from that place. The two otters realized their mistake and decided that they should not fight like this in the future. MORAL : When there is no unity, outsiders take advantage.